This is an incredible read. The author deftly weaves through the real stories of four individuals from the late 1930s during the second Sino-Japanese War and during the aftermath when the KMT and CPC clashed. What is amazing about this book is not only does it give you a great frame of reference of the history and the consequences of war, but the stories are deeply personal and emotional. Mostly told from the point of view of children who grew up during this period, the urgency of survival and t This is an incredible read. The author deftly weaves through the real stories of four individuals from the late 1930s during the second Sino-Japanese War and during the aftermath when the KMT and CPC clashed. What is amazing about this book is not only does it give you a great frame of reference of the history and the consequences of war, but the stories are deeply personal and emotional. Mostly told from the point of view of children who grew up during this period, the urgency of survival and the sense of chaos during this period of China's history is caught on every page. The Last. Boat Out of Shanghai is an excellent engrossing read. Zia proffers snapshots of four people who escaped from China prior to the onslaught of the Communists. Each story is fascinating and equally gripping. The notes are extensive as well as the bibliography. The author provides a follow up to each person showcased in the book. It's a must read for anyone interested in Chinese or Asian history. Thanks to NetGalley for the advance copy. this is the story of Chinese migrants from Shanghai who were force out of their home city by war and communism. There are four main characters in the book and we follow them from the late 1920s until their final lives. We learn about the lives of the four during the 1930s leading up to the eight year occupation by the Japanese. We learn how they each survived the Cultural Revolution and their lives as emigrants in Hong Kong, Taiwan and the US. The Chinese who fled to Hong Kong after the Red take- this is the story of Chinese migrants from Shanghai who were force out of their home city by war and communism. There are four main characters in the book and we follow them from the late 1920s until their final lives. We learn about the lives of the four during the 1930s leading up to the eight year occupation by the Japanese. We learn how they each survived the Cultural Revolution and their lives as emigrants in Hong Kong, Taiwan and the US. The Chinese who fled to Hong Kong after the Red take-over had to deal with British restrictions and racism. But the Shanhaiese were known for their energy and helped build the city that became on of the Asian Dragons. The same can be said of those who fled to Taiwan. The Chinese who fled to the US we at one time limited to jobs in restaurants and laundries, but were able to work their way in the middle class like so many ethnic groups. The story of the man who stayed in China and married, tells the story of the treatment of the petit bourgeoisie who were criticized for being the enemies of the 'people'. One man spent 10 years under house arrest in a small town, because he was a college graduate. During this time his wife was sent to another rural town as a teacher, there were many years where they had no contact. This is a nonfiction story following the lives of 4 emigrants from China during the cultural revolution. I liked this book because the 4 individuals were painted so well. I was very empathetic to their life situations and I wanted to keep reading to see how they would do. Also, I appreciated the opportunity to learn about China's cultural revolution and the roles of Taiwan and Hong Kong. This is a good historical nonfiction book written like an historical novel. I loved this book and couldn't put it down. It is a story of resiliency and survival during the period from 1937-1957 in China. The research and details the author provides about China and the countries/factions wanting control appears exhaustive and thorough. I learned much about this part of the world and about immigrants to the US of any nationality. It's a long book, 430 pages, but well worth the read. This nonfiction history book tells the stories of four Shanghai people who lived through the Communist Revolution. The writing lacks literary flair, but I cared a lot about following each person's life. I've read other books from this time period, but this focuses on the cosmopolitan city of Shanghai and how people with means navigated the terrors of war and authoritarianism. Scary idea (although this book less about political theory, more about personal experiences that shed light on important This nonfiction history book tells the stories of four Shanghai people who lived through the Communist Revolution. The writing lacks literary flair, but I cared a lot about following each person's life. 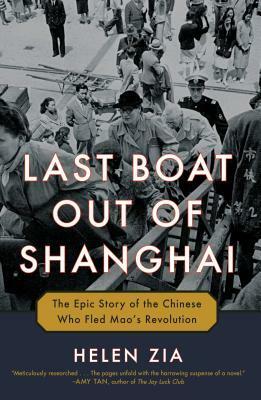 I've read other books from this time period, but this focuses on the cosmopolitan city of Shanghai and how people with means navigated the terrors of war and authoritarianism. The Shanghainese focus disclosed in the title makes this a less comprehensive read about Chinese history than I had wanted, but it allowed for rich detail and vivid color about being roughly a Nationalist in Shanghai from 1932-1960. The writing moves and immerses, and the editing is so very thoughtful, beginning as a seemingly disparate patchwork of unrelated stories close in time and space, then braiding together beautifully with a very touching capstone. I was afraid to bring the book to China The Shanghainese focus disclosed in the title makes this a less comprehensive read about Chinese history than I had wanted, but it allowed for rich detail and vivid color about being roughly a Nationalist in Shanghai from 1932-1960. The writing moves and immerses, and the editing is so very thoughtful, beginning as a seemingly disparate patchwork of unrelated stories close in time and space, then braiding together beautifully with a very touching capstone. This gives a behind-the-curtain look at China from 1930’s through the defeat of the Nationalists and rise of Communists. Sounds dry?...not at all. The personal stories are the frame for history and culture. Each one quite different, but each contributing to a view of the very complex landscape of the Cultural Revolution. We know much of Europe during and after WWII but little of Asia’s upheaval. Here is a story of the heroic and the hedonistic.. of great privilege and and great privation and the This gives a behind-the-curtain look at China from 1930’s through the defeat of the Nationalists and rise of Communists. Sounds dry?...not at all. The personal stories are the frame for history and culture. Each one quite different, but each contributing to a view of the very complex landscape of the Cultural Revolution. We know much of Europe during and after WWII but little of Asia’s upheaval. Helen Zia - Helen Zia is the author of Asian American Dreams: The Emergence of an American People, a finalist for the Kiriyama Pacific Rim Book Prize (Bill Clinton referred to the book in two separate Rose Garden speeches). Zia is the co-author, with Wen Ho Lee, of My Country Versus Me: The First-Hand Account by the Los Alamos Scientist Who Was Falsely Accused of Being a Spy. She is also a former executive editor of Ms. magazine. A Fulbright Scholar, Zia first visited China in 1972, just after President Nixons historic trip. A graduate of Princeton University, she holds an honorary doctor of laws degree from the City University of New York School of Law and lives in the San Francisco Bay Area.